I am very, very lucky that God saw it fit to bestow me with a mad love of all things grain-y and wheat-y, alongside my obsession with all thing pork and fatty. It’s really a mystery and a miracle, how the world works. My love for that which is supremely bad for me, is gracefully counter-balanced (I hope!) with my craving for healthy grains/wheat/oats. As much as I can wax poetic about chicharon and bacon, I can also pay the same tribute to things like bran flakes and muesli. 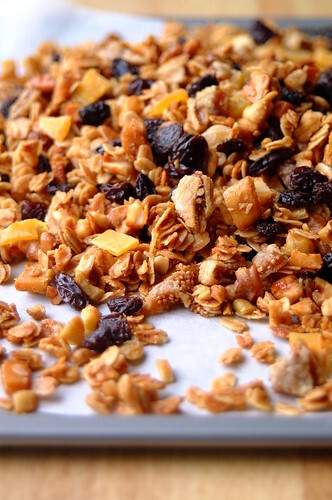 Bran flakes, muesli, granola, oatmeal…any form of grain, wheat, oat, grit, or grub. I love them all. Maybe even those I have yet to meet (and I do look forward to that meeting!). There is just something about their nutty, fiber-y personality that makes me keep coming back for more. Their being good for me has nothing to do with my love. I don’t love foods because they are good or healthy, or part of the Super Duper Six. I love them because of their taste and texture…because of the way they make my taste buds smile when I have them. And this year I have decided to do just that – make my taste buds smile. No counting calories, no diets, no equations and conversions. And no referring to food as “carbs” and “protein” and “fat”. I’ll say their names loud and proud (Rice! Veal cheeks! Goose lard!). I’ll eat what I want, and not bother with what I don’t. I will listen to my body – its needs, and wants, and cravings. And hopefully, in the midst of this, I will find my own personal equilibrium – set by my body and its secret rhythms, and not by anyone else’s rules and regulations. In 2008, food will be my friend. An ambitious goal, perhaps even dangerous, but I’m determined. So thank goodness that chicharon is not the only thing I like to eat! – Mix the oats and nuts in a bowl – I used my hands. – In a separate bowl mix the oil and the honey. Whisk briskly with a wire whisk until oil and honey become a homogenous, sticky syrup. – Pour the honey/oil mixture onto the oats/nuts mixture and stir well until thoroughly blended. – Place mixture on a foil-lined cookie sheet and spread out flat and even. – Place pan in a 180-190C oven and roast for about 30 minutes. After the first 10 minutes, stir the mixture. Stir again once or twice before it’s done. Remove from the oven to cool (I transferred the granola to another cookie sheet lined with parchment paper to cool). – When cool add the fruit and toss until combined. Store in a clean, dry, and airtight container. This recipe is based on this one from Marketman. I had bookmarked it eons ago and, in my usual hundred-years-to-action fashion, I only tried it now. 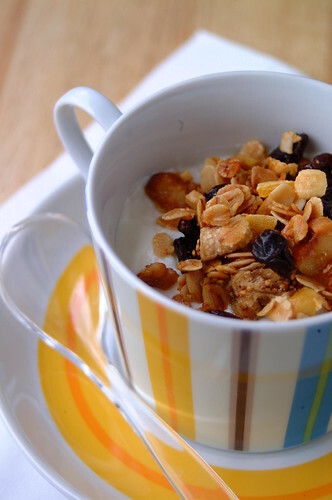 But it is never too late for granola…even more so when it is as simple and as yummy as this! I halved most of the quantities here (I’m probably the only one going to be eating this in my place) and made it more a general formula than a strict recipe. I just indicated the volume for fruits and for nuts, and you can feel free to use whatever combinations of each your heart desires. I had some to top my yogurt (as pictured here), and will be having future breakfasts with it in my cereal with milk, and sprinkled on my oatmeal. This is my first attempt at making granola from scratch and I must say, I am quite pleased 🙂 I have even set some apart for my mom! I hope she likes it 🙂 Don’t forget! Deadline to submit your entries for this round of Hay Hay it’s Donna Day is this Saturday, January 26. The theme is Pizza and I can’t wait to see what you come up with! I have already received entries and I don’t envy those who will be doing the voting…they are all fantastic and the choice will be a tough one! Hi! 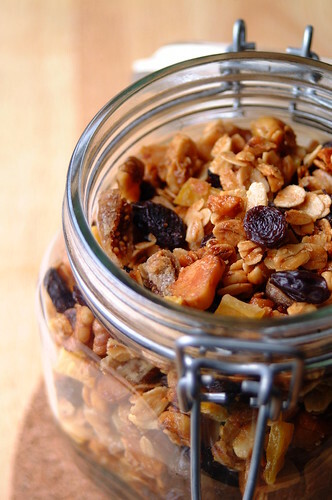 I was looking for a great granola recipe, and yours is wonderful with the exception of the baking time and temperature. I converted to Fahrenheit, but about 20 minutes in, my granola was burnt. 🙁 not good!